Seeking to avoid a strike by hundreds of small gas-station operators, several local politicians have intervened in a dispute between Getty gasoline distributors and the station operators, who are fighting for higher compensation. The legislators, including U.S. Rep. Jerrold Nadler who represents parts of Manhattan and Brooklyn, sent a letter to Getty Realty Corp. GTY -0.59% —the landlord for hundreds of Getty gasoline stations—and four of Getty's gasoline distributors, urging the companies to negotiate better terms with small operators. John Katsougrakis has been a Getty station operator in Brooklyn since 1990. He says the station is unprofitable and he may have to close. The biggest grievance of the operators: the 6.5 cents commission they earn on each gallon of gas they sell hasn't changed in 15 years and isn't enough, they say, to cover basic expenses like rent, licensing permits and wages. The station operators are asking that their commissions be raised to 15 cents for each gallon sold. They also want their leases extended to three-to-five years rather than the month-to-month terms that began last year. "The stagnation in their compensation has placed these businesses, many of which are small and family-owned, at a crippling disadvantage with their competitors who receive 15 and 35 cents per gallon from other dealers," said the March 6 letter, which was also signed by state Sen. Diane Savino, Assemblyman Matthew Titone and City Council members Domenic M. Recchia Jr. and Debi Rose, in addition to Rep. Nadler. All the letter signers are Democrats. In an interview, Mr. Recchia said that if the distributors don't meet with the operators soon, he will consider seeking ways to force the businesses to the negotiating table. "The big oil companies [are] taking advantage of the little mom-and-pop gas station owners who work day in and day out selling gas and are not being compensated," said Mr. Recchia, who represents the Southern area of Brooklyn. Earlier this month, the Getty gas station operators in the New York, New Jersey and Pennsylvania staged a three-day strike during which they refused to sell gas in protest of their commission and short-lease terms. They called off the strike on the request from politicians who feared the strikes would lead to the type of gas shortages that occurred during superstorm Sandy. In response, some operators said some of the gas distributors threatened to evict them, although the politicians have asked the distributors to suspend any possible evictions. The Petroleum Dealers Group Inc., a trade association in Staten Island that represents more than 400 Getty stations in the Northeast, says Getty stations operate at a loss of roughly $100 a day compared with an average profit of $300 a day for operators of Shell and Mobil gas stations. In addition, the Getty operators say they pay out of pocket for property repairs that they say ((are supposed to be shouldered by the landlords. 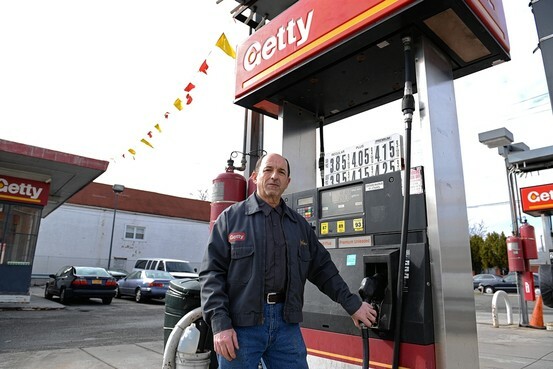 Getty Realty, a real-estate investment trust based in Jericho, N.Y. that owns more than 900 gasoline stations, didn't return calls seeking comment. Getty Realty was formed in 1997 when Getty Petroleum Corp. split to form it, Getty Petroleum was eventually rebranded as Getty Petroleum Marketing Inc., which leased the stations from Getty Realty, then subleased them out to small operators and distributed gasoline to the stations. Getty Marketing filed for bankruptcy-court protection in 2011. Since then, Getty Realty has replaced its former tenant with several new distributors who sublet to the small operators. Lease terms for the station operators became month-to-month during the bankruptcy restructuring. One distributor, BP Petroleum, BP.LN -0.67% said in a written statement that "BP made good faith offers of rents and commissions to the lessee dealers." Global Partners LP GLP +0.06% declined to comment and the other distributors—Lehigh Gas Partners LGP +0.26% and Ramoco Fuels—didn't return calls for comment. Louis Lombardo, a spokesman for Petroleum Dealers Group, said the situation for the Getty operators has become dire. Small operators that have managed their stations for decades "could lose everything," he said. Among them is John Katsougrakis, a Greek immigrant who became the operator of a Brooklyn Getty gas station in 1990. He says that operating his station is unprofitable and he may need to close the business. "If I close the store, all I go out with is my pants and jacket. I can't even get $10 for the 23 years that I put into this business," he said. Mr. Katsougrakis said the rent on his station, located in the Marine Park section of the borough, has risen from $1,500 a month when he first opened to nearly $8,000. "If there is a good reason why they can't increase the commission, I think the operators...are entitled to know what that reason is," said Assemblyman Titone, from Staten Island. He said that, so far, they have received no response from Getty or the distributors. NEW YORK -- Seeking to avoid a strike by hundreds of gas station operators, politicians have intervened in a dispute between Getty gasoline distributors and the station operators, who are fighting for higher compensation, reported The Wall Street Journal. U.S. Representative Jerrold Nadler (D-N.Y.), who represents parts of Manhattan and Brooklyn, sent a letter to Getty Realty Corp.--the landlord for hundreds of Getty stations--and four of Getty's gasoline distributors, urging the companies to negotiate better terms with operators. The biggest grievance of the operators: the 6.5 cents commission they earn on each gallon of gasoline they sell has not changed in 15 years and is not enough, they say, to cover basic expenses like rent, licensing permits and wages. The operators are asking that their commissions be raised to 15 cents for each gallon sold. They also want their leases extended to three to five years rather than the month-to-month terms that began last year. Domenic M. Recchia Jr."The stagnation in their compensation has placed these businesses, many of which are small and family-owned, at a crippling disadvantage with their competitors who receive 15 and 35 cents per gallon from other dealers," said the March 6 letter cited by the newspaper. State Senator Diane Savino (D), Assemblyman Matthew Titone (D) and City Council members Domenic M. Recchia Jr. (D) and Debi Rose (D), also signed the letter. Recchia said that if the distributors do not meet with the operators soon, he will consider seeking ways to force the businesses to the negotiating table. "The big oil companies [are] taking advantage of the little mom-and-pop gas station owners who work day in and day out selling gas and are not being compensated," Recchia, who represents southern Brooklyn, told the Journal. Earlier this month, the Getty operators in New York, New Jersey and Pennsylvania staged a three-day strike during which they refused to sell gasoline in protest of their commission and short lease terms. They called off the strike on the request from politicians who feared the strikes would lead to the type of fuel shortages that occurred during superstorm Sandy. In response, some operators said some of the distributors threatened to evict them, although the politicians have asked the distributors to suspend any possible evictions. The Petroleum Dealers Group Inc., a trade association in Staten Island that represents more than 400 Getty stations, told the paper that the stations operate at a loss of about $100 a day compared with an average profit of $300 a day for operators of Shell and Mobil stations. Also, the operators said they pay out of pocket for property repairs that they say are supposed to be shouldered by the landlords. Getty Realty, a real-estate investment trust (REIT) based in Jericho, N.Y., that owns more than 900 stations, did not return calls from the Journal seeking comment. It was formed in 1997 when Getty Petroleum Corp. split; Getty Petroleum was eventually rebranded as Getty Petroleum Marketing Inc. (GPMI), which leased the stations from Getty Realty, then subleased them out to operators and distributed fuel to the stations. GPMI filed for bankruptcy in 2011. Since then, Getty Realty has replaced its former tenant with several new distributors who sublet to the small operators. Lease terms for the station operators became month-to-month during the bankruptcy restructuring. One distributor, BP Petroleum, said in a written statement provided to the paper that "BP made good faith offers of rents and commissions to the lessee dealers." Global Partners LP declined to comment and the other distributors--Lehigh Gas Partners and Ramoco Fuels--did not return calls from the Journal for comment. Louis Lombardo, a spokesperson for the Petroleum Dealers Group, told the paper that the situation for the Getty operators has become dire. Small operators that have managed their stations for decades "could lose everything," he said. "If there is a good reason why they can't increase the commission, I think the operators ... are entitled to know what that reason is," Titone told the paper. He said that, so far, they have received no response from Getty or the distributors. STATEN ISLAND, N.Y.--Staten Island Getty gas station owners ended a strike on Wednesday after public officials asked them to resume pumping gasoline in the wake of a winter storm, reported The Staten Island Advance. In return, public officials promised to spearhead a "sit-down" with Getty's parent company for a resolution. A notice on the owners' website--www.gettydealers.org--read: "By request of government officials and in the interest of our customers, with the impending weather threatening our area we will immediately begin selling gas. We will still continue to work on resolving our issues amicably with the gas distributors." The website warned of eviction threats: "They will have to go to court to throw you out, and we will have our day in court if they want to go that route. It added, "The gas distributors are approaching with promises. Be aware, we went through this before. All promises must go to the dealers council and in-house attorney." The public officials and about 50 Getty station owners from Staten Island, Brooklyn, Bronx, Long Island, Westchester and Philadelphia attended a strategy meeting on Wednesday at Giovanni Cutillo's Nino's Auto Repair, a Getty station in Grant City, N.Y.
Cutillo is president of the Petroleum Dealers Group, which represents more than 400 Getty stations throughout New York, New Jersey and Pennsylvania. Eleven stations were in danger of being evicted from their leased property in 10 days if station owners continue to protest the small commissions and the lack of long-term lease agreements, said the report. Hudson Petroleum Realty Inc., New York, hand delivered default notices dated March 4 to Getty station owners who stopped pumping gasoline on Monday. The notices, delivered on Tuesday, said station owners will be evicted from their properties if they default on their license agreement, which requires them to pump fuel daily. "The dealer is refusing to offer Hudson's Getty-branded motor fuel for sale at the site," wrote Terry Fitzgerald, vice president of marketing for Hudson Petroleum Realty, in a notice to Nino's, according to the newspaper. If Nino's doesn't "cure the above referenced default," Hudson will immediately terminate the license agreement and Nino's Auto Repair will have to "immediately vacate the site," the letter said. The station owners said earlier this week that they would remain closed until they receive a 15-cent commission instead of the 6.5 cents they now get on every gallon of gasoline that they sell. That figure, they said, is unchanged since 1996. The notice is Hudson Petroleum Realty's "way of scaring people," Cutillo told the paper. "I got a phone call on Friday from Hudson Petroleum Realty and they told me if you don't stop this nonsense, you'll have to pay heavy consequences." A typical Getty station pumps 1,500 gallons of gas per day, according to the report, and that yields $97.50 per day in commissions. It is not enough to offset the average of $189.57 per day for all fees and labor costs, leaving stations with a daily average revenue loss of about $92.07. The owners are also demanding more favorable leases--many have been leasing month-to-month after Getty Petroleum Marketing Inc. (GPMI) declared bankruptcy in Dec. 2011 and it sold the leases to Lukoil. "We want three-to-five-year leases for our property," Mohammad Ismail, who owns a Getty station in Graniteville, N.Y., with Firoz Mithawala, told the paper. "These small-business owners make peanuts off their gas sales, on average less than 5 cents on the gallon; their main income is in vending or food sales and the body shop/garage," Michael Arvanites, deputy chief of staff for state Senator Diane Savino (D), who attended the protest, told the paper. Station owners say they were initially lured to open a Getty station by the company's promise of "competitive pricing." Cutillo said there used to be more Getty stations on the Island, but the low commission drove them out of business. open link below for bankruptcy info on Getty petroleum marketing inc. The only news we know for a fact : Getty dealers have higher gas prices then market price around them. please send emails with other information you would like posted.